If you are reading this page, a client or business partner may have sent you an invitation to start using EasyBooks Sync. EasyBooks is a double-entry accounts package for Mac and iOS devices. Although the app works offline from its local databases, one of the services we offer is Online Backup and Sync. This allows business owners to store a copy of their data online for backup, and gives them to ability to use EasyBooks on any device. The system keeps track of any changes, and devices are updated automatically. Business owners also use Online Sync to share their data with their accountant. Unlike traditional file-based systems, it is not necessary to import and export data. And EasyBooks differs from purely online accounting platforms, allowing people to use the app on the go, even if no network connection is available. EasyBooks syncs any changes made when it next connects to the network. Register for your own Online Sync account if you have not already done so. If you use a different email address than in your invitation, please contact the person sharing their business and tell them which email address you used. They will need to re-share using this email address. Download and open EasyBooks (Mac or iOS). 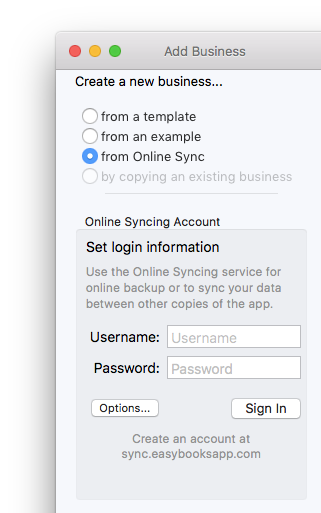 Choose the option to create a new business from Online Sync. Fill in your email address and password and click Sign In. Choose the business from the list of businesses available to download and click Create. If you already have businesses in EasyBooks, you can start syncing a new business from the Online Syncing screen. Refer to "Adding a new Device". Full access. While working with their business, you can also share the features of their subscription. You do not need to purchase your own subscription unless you want to create your own businesses. Read & write. You can view the accounts and make changes. You will need to purchase your own subscription to work with more than 60 transactions, send invoices, or work in more than one currency. See the Pricing Page for pricing information. Read only. You can view the accounts, but cannot make any changes.